Dmitry Anatolyevich Medvedevn; born in Leningrad (now St. Petersburg), Russia, 14 September 1965 ) is a politician and Russian Deputy Prime Minister of the first. He was elected as president on March 2, 2008. Official election results declared on March 7, 2008. He served from May 7, 2008. Dimitry Medvedev Anatolyevich known as Dimitry Medvedev was born in a family of teachers. His late father, Anatoly Afanasyevich Medvedev, is a professor at the Leningrad Technological Institute Lensoviet. His mother, Yulia Medvedeva Veniaminovna, is a language instructor at the Herzen Pedagogical Institute. Medvedev parents encouraged him to study science, but he is more interested in the legal field. Medvedev himself majored in law at Leningrad State University Law School. In the course of his career, Medvedev went on to a doctoral program and was completed in 1990 with a specialization in private law, corporate and securities. Since then, he taught until 1999. During college, his friends describe Medvedev as a highly studious, polite and reserved. During the teaching, he wrote a number of textbooks for college. Since the rising profile, he learned to open up and talk more openly. Medvedev met his wife, Svetlana Vladimirovna Medvedeva, while still in school at level seven. They married in 1989 and has one son, Ilya Medvedev Dmitievich. How busy activities, Medvedev took the time to exercise, especially swimming and weight lifting for an hour in the morning or late afternoon. Then have the hobby of jogging exercise, chess and practicing yoga. Medvedev still has time to listen to classic rock music. His favorite bands are Deep Purple, Led Zeppelin and Black Sabbath. 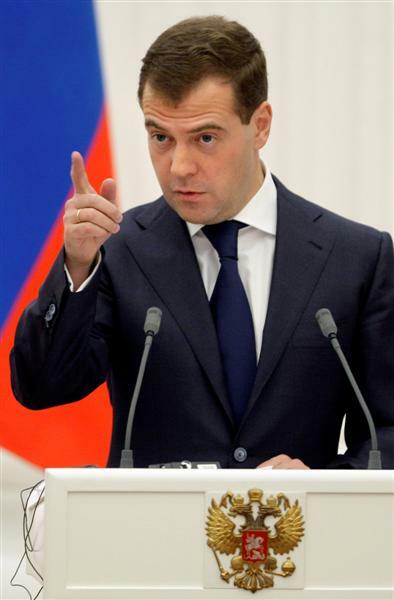 Medvedev became the legal consultant in several companies and government institutions. When Anatoly Sobchak, a lecturer Medvedev at Leningrad State University, was elected mayor of Leningrad, in 1991, Medvedev worked as legal adviser to Sobchak and legal consultant for the external affairs committee headed by Vladimir Putin. Since then he and Vladimir Putin worked. After President Boris Yeltsin appointed Vladimir Putin as his successor at the end of 1999, Putin called Medvedev to Moscow to become deputy head of presidential administration. Medvedev then assigned to a new position as first deputy prime minister. In the election campaign in Russia in 2000, Medvedev became the campaign manager Vladimir Putin. In addition to leading the staff in charge in the Kremlin, Medvedev was given a number of special projects, among others, led the commission to develop a framework of civil service reform legislation and best control over the legal system of Russia. Proximity to Vladimir Putin is very helpful in jump-start a career in the ranks of the Kremlin Medvedev. But unlike most of Russia's political elite, Medvedev did not acquire his position in politics through the ranks of the KGB. In www.russiaprofile.org internet sites mentioned, throughout his political career in the Kremlin, Medvedev called the players behind the scenes. Medvedev promised that if he was elected as president of Russia, he said it would take off position on the board of directors of Gazprom, Russia according to the laws now in which a president must not have another position. Medvedev career in the business world. After completing his doctoral program, she co-founded a small company named Uran state. In 1993, Medvedev joined Ilim Pulp as director of legal affairs and managed to turn the company into the number one paper processing companies in the country. Career in the business skyrocketed when President Vladimir Putin in 2000, he served as chairman of Gazprom's board of directors. In an interview with Vedomosti, Medvedev said the key economic sectors such as energy and defense industry sector should remain in the hands of the state to ensure companies in these sectors have political influence at home and abroad. Medvedev policy style by taking the example above statement can be said with liberalism is controlled. That is, the state could be involved only in the case of very large or very high-stakes case for private enterprise to be successful. In a speech in 2008, Medvedev said that the more freedom, better than no freedom. Medvedev a lot of talk about economic freedom, human rights and freedom of expression. Medvedev also called for reform of the judicial system and the real separation between the executive and legislative powers.